Don’t Talk About it, Just Do It! As a teacher we often face challenges on the best way to impart knowledge to our students. Most of us recognize that our students are individuals with various levels of ability and experience. I think one thing is certain. Many of us are visual learners to one degree or another. This is not just confined to art students. Years ago I taught private lessons to a pretty well known thoracic surgeon who had recently retired from a teaching hospital. As we progressed in our lessons he remarked that my teaching approach was very similar to the model his institution had used. They had labeled it as “Do one, teach one.” While artists may not think of themselves as surgeons there are some similarities. Painters, like surgeons must have good visual acuity and excellent hand eye coordination. Like many students they do better with concrete visual demonstrations that help support any written or spoken theory they may have. Many years ago I was a student in an art school. I had come from a university and was very well versed in all sorts of verbal art theory. In the first few days my new teacher cut me off in mid sentence with the stinging words, “Shut up and paint!”. Excellent advice. These days I still take that to heart. If you want to talk art, do that outside the studio with friends or acquaintances. If you are trying to help a fellow painter or student then SHOW THEM, don’t talk about it. At least that is my philosophy. I try to do impromptu demos for my students at least once a month, often more frequently. Whenever a question about an approach or techniques arises I get out my watercolor block paper and paints. We work out the issue at hand. No involved preliminary, just a simple sketch at best and then color. It seems to work wonders. Recently one of my students was contemplating painting a hydrangea. If you love flowers then you know that this is one mass of flower petals that can be rather complex. So where do you start? How do you capture it? If you are the least bit compulsive you may want to attempt to capture every blossom. That can be a worthy goal but far too often one winds up with a stiff presentation of an over worked mess. This is especially true if you are just embarking upon our journey in painting. Unfortunately I didn’t think to take a shot of the first layer of wash but hopefully you get the idea. First I want to dispel the prevailing myth that one cannot alter watercolor. In my opinion all painting is a series of refinements. I think these two examples demonstrate that fact. The first application was a general blob of new Gamboge that was of varying intensity that sort of approximated the overall shape of the flower mass. It was allowed to dry. Then each progressive wave of color was applied with increasing accuracy. Note the leaf structure in the first passage. It is no where near the proper size and the beginning layers of color in the flower appear to depict a type of rose instead of a hydrangea. The permanent magenta was strengthened with some thalo blue as the application of washes progressed. You can see how the thalo blue washes influenced the magenta to create a violet hue in places. Only a few key areas were refined to give the impression of individual petals. In final approach the stems of sap green and some thalo blue were painted on a fairly dry surface. Remember, if you want soft edges paint wet into wet, if you want sharp edges paint directly onto dry paper. Flowers can be deceptive. Often the color is strong but the edges are at times softly blended. Start wet into wet and progress into dry applications as you seek to get more detail. Trying to explain this verbally is most difficult. Watching the painting progress is far superior. The student’s question was answered and she was able to apply the lesson to her own work. Like other media, watercolor can be refined. Start with a general shape and get specific with each additional stroke. Look for a focal point in order to convey the spirit of your subject. If your first stroke is not too accurate seek to correct successive strokes. FOCUS. 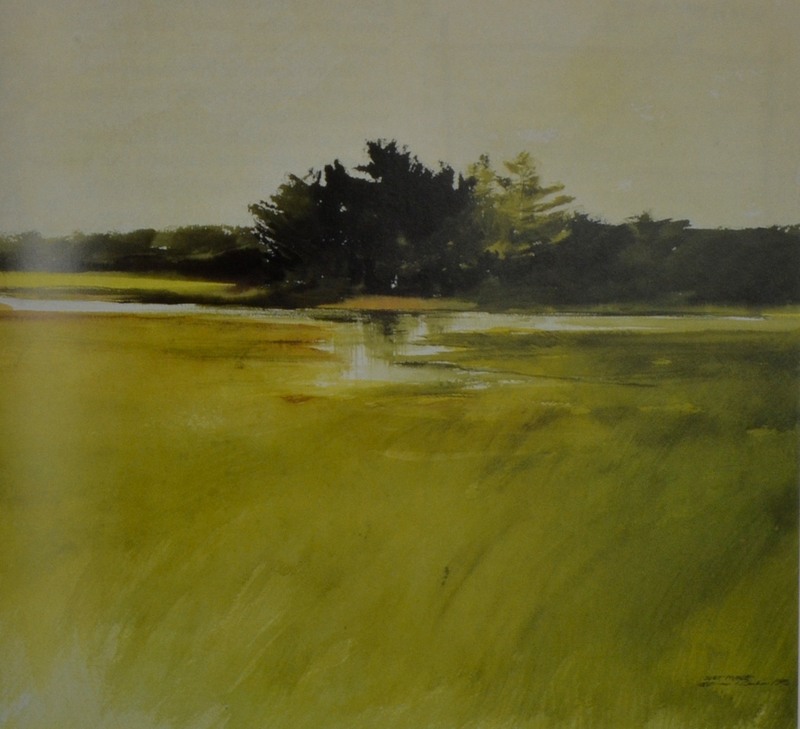 Glazing techniques in watercolor can be an excellent way to introduce subtle as well as dramatic color arrangements into your work. An added benefit is the illusion of depth due to multiple layers of color. As a general rule make sure each wash is completely dry before applying the next wash. If you need more softness or variation in effect you can alternate layers of wet into wet application with passages of direct application. The possibilities are limited by your imagination. For ideal effect just make sure each wash is dry before you apply the next. This piece took about 30 minutes to complete so don’t think that glazing can’t be quick and easy. Like anything else; practice makes perfect. The Antique Shop http://www.createspace.com/350893 Enjoy a 1 hour 55 minute remastered classic now available in DVD format, even better quality than the original VHS. A live on site demonstration includes painting with the glazing technique plus additional tips on selecting and composing the elements for the painting. Study watercolor glazing techniques on line with Don Rankin: Study the beginning levels of the watercolor glazing technique at your own pace. Watercolor classes every Thursday, except holidays, with Don Rankin at Artists on the Bluff, Bluff Park, Alabama. Contact: Ms. Linda Williams, Director, 205-532-2769. artistonbluff@gmail.com Come enjoy one on one instruction geared for beginner as well as intermediate and advanced students. I believe in demonstrating procedures and ideas when teaching a group. My weekly class at Artists on the Bluff gets impromptu demos a lot. The old saying “A picture is worth a thousand words!” is so true. Very often a student will have a question that is best answered with a demonstration. I’m going to share the steps below. First move: You can see some pencil lines. Usually I put these in so my students can get an idea of my plan. The basic pencil lines help to set boundaries. You can see the horizon line, some rough indications for the shape and size of the barn, etc. In short I have set up a basic road map. It is a road map I may or may not follow. The guidelines are there for orientation. Pencil lines and painted shapes of color have a different dynamic. I’m painting; so color rules. Order: Everyone had an idea of the placement and composition. Now comes the execution. I usually paint sky and background elements first. Not always but usually. Why ? It is easier. The sky was painted wet ‘n wet. That is the paper was flooded with clear water first, taking care to avoid the shape of the barn. Hint: The wet wash will not freely migrate across into the dry area unless you have too much of an angle or too much water on your paper. As the initial sky wash of Holbein Marine Blue with a touch of Perylene Maroon was drying I carefully dropped a stronger wash of the same mixture into the dampened sky area being careful to avoid the silo and the barn shape as well as the foreground. While that area was drying I carefully applied the foreground of M.Graham Gamboge with a bit of the residue of Perylene Maroon and Marine Blue still lingering in my brush. The resulting bronze color is a perfect winter color. By the way most of this wash at this stage was executed with a 3″ flat brush. The exception was the pale vermilion red and blue wash on the front of the barn. At first glance you can see some not so clean wash edges, in some places pretty crude. The white edge on the left side of the piece was left in order to prevent the wet sky and wet foreground from mingling. The white edge of the barn on the shadow side was inadvertently left and will soon be refined. Why this demo, why this approach? At times I think that we all think too much. This is especially true of beginning watercolor painters. Note I wrote “painters.” Like many of you I run across the woefully ignorant who like to think that watercolor isn’t a painting medium!! I’ve even run into this idea among so-called educated teachers with a lot of alpha bet soup tagged on the end of their names. My point is that painting is painting, period. The medium we choose does not negate the fact that certain concepts of painting are largely universal and only altered by the requirements of the media we choose to use. If you study the works and methodology of painters like Richard Schmid and David Leffel you will find that many of their approaches can be applied to other painting mediums. Certainly watercolor, like other media, has its own requirements and approaches. Do you recall the first time you attempted to paint a watercolor? Did you make a lot of preparation, planning what you were going to do? While it is desirable to have a goal in our work; at times, students came become a nervous wreck by planning too much. It is almost as perilous as the brave soul who just jumps in without any plan what so ever. In many ways I favor the student who bravely dives in throwing caution to the wind. Having written that I need to clarify. Looseness in a painting methodology is NOT the same as being sloppy. Looseness comes from confidence and relaxation after one has mastered a few basics. All washes were dry when I used a size 6 Winsor & Newton Series 7 brush to paint in the general shape of an old oak tree. The wash was American Journey Andrews Turquoise. The fence line was a mixture of the Marine Blue and Perylene Maroon. Note the fact the the shadow side of the barn was now repaired and a bit of Marine Blue w/ Perylene Maroon provided a shadow for the edge of the roof line. A dilute mixture of the same color was used to cast the shadows on the front of the barn. Darker washes were mixed to define the tree. At first glance the turquoise wash was not too powerful. However, alternating a stronger pattern of a mixture of dark blue and maroon created a strong optical black. Note where the darker wash was applied to the limbs and where it was omitted. Take time to study the patterns of light and shadow on trees to help make your images more convincing. The same dark was used in the space between the barn and silo to help clean up and define the edges of the barn. A portion of the fence appears to have a highlight as it approaches the barn. No masking or scraping out was used to create this effect. Recall that the shadow side of the barn was once a lighter color. Here the sequence of painting was reversed. The dark shadows between the fence rails was painted leaving the lighter wash to appear as a highlight. This is refined even more in the final stage of the painting. As an added thought, a bit of turquoise was applied to the shadow side of the roof. The last refinements have been added in this small demo. You can see the planks in the barn siding as well as in the door. Some would think of the structural qualities of the building but I chose to use vertical lines on the door in order to break up the rhythm of the horizontal lines. While it is probably more accurate in terms of construction; I wasn’t concerned with that. I was thinking of harmonic rhythm and contrast. Contrast exists in all forms, not just in lighter and darker values. The fence gate was defined using the same technique of negative painting. That is the shadow shapes were painted and the lighter underlying wash was left exposed to create the illusion of highlight. Many wise painters stress introducing color into various areas of the picture plane. One commented on making an excuse to introduce color into various areas. Look carefully in the foreground and you will see some hints of turquoise and hints of red. It just helps to balance out the color. I have written all of this to say….RELAX. Too many tall tales strangle the flow of watercolor. Examine each step and you will see how darker/stronger color has been used to clean up or refine the image. An attempt to produce perfect washes in every application often breeds frustration or a terribly stiff watercolor. I did this little watercolor to assure my students that you have the ability to refine and polish your work as you go. This is a small demo that required a short period of time but the principle applies to more involved works as well. As the layers dried I used smaller brushes for the defining moments but in the beginning I used the largest brush I could find. In the words of Delacroix, “Start with a broom, finish with a needle.” I can’t say it any better. Want to know more about Don’s watercolor glazing techniques? This is a cropped version of a piece that was inspired and developed on site in Maine a few years ago. If you have never experienced a salt marsh, do so with a bit of caution. What appears to be solid ground is often anything but solid. In a few hours all of this lovely expanse of grass will be underwater. It all depends upon the tide. Those of you who live in areas such as this know all too well how things can change very quickly and without warning if you are unaware. It is sort like life. My palette was purposely limited to a few predominant colors The initial sketch in was done with a lot diluted new gamboge on a damp piece of paper. If you look closely you can see the new gamboge peeking through a portion of the trees and even a bit in the sky. About the only section that did not get covered with color was some of the lighter reflected areas in the marsh. This piece was executed in a fairly rapid manner. The composition or placement of the shapes was critical to the effect I was attempting to achieve. Most of the work was completed with a three inch bristle brush. Yes, I use bristle brushes at times. I just make sure that they have never had anything other than watercolor in them. Experimenting with various techniques and tools can help you make meaningful discoveries. Naturally the opposite is also true. There are times when experiments fail. No one is perfect; if you crash and burn just chalk it up to experience. If you opt to use bristle just remember that damp watercolor paper can only stand so much scrubbing before the surface gets scarred. Use a delicate touch unless you want to create a rough surface. Also be aware that if you disturb a portion of the wet surface; when it dries the color will be darker than the rest of the passage where the paper was not abraded. After the initial wash was dry I wet the paper again and flooded a light wash of thalo blue into the sky and down into the water area. Once that was dry the darker washes were applied. The first area of foreground was a mixture of new gamboge and thalo blue. While portions of the wash was still wet; a bit of Winsor red was introduced in select areas to produce the brownish effect. After that wash dried I came in with darker washes of thalo blue, sap green and Winsor red with direct strokes on dry paper. The edges of the trees give evidence of the effect of the damp brush on dry paper. Some of the final strokes in the foreground were accomplished on dry paper. Although the paper is a full sheet, the execution was pretty rapid. Painting outdoors will help motivate you to move quickly. Even though this piece was finished in studio the initial execution was influenced by the first encounter. If you sketch and paint outside you soon realize that the lighting changes rapidly. In fact it changes every two seconds. It may not seem that way at certain times and at times the change is somewhat subtle. However, when you get to the end or beginning of the cycle (sunup & sundown) the change becomes more apparent. As a result you need to make quick decisions and plan accordingly. Think about big shapes and how they interact with other shapes. Explore the effects of color in relation to shapes. In short, keep on painting. If the first attempt is not stellar then try again. In fact, if you are totally delighted with the results of your painting effort then chances are that you are not testing yourself enough! . Don’t beat yourself up but do be your harshest critic. At times when I’m in the studio and a large wash is drying I will cruise the Internet just to see what I can see. This was one of those moments. I happened upon a recent work by John Salminen and was admiring his approach. Now John has a large number of DVD’s and if you really want to get into this you will want to buy some of his videos. First I would be remiss if I did not give credit to John for this discovery. I think a workshop student introduced it to him. There was some internet postings expressing concern over the use of this product for watercolor. A few painters were concerned that it might contain some chemical that would be harmful to watercolor paints and/or paper. John went to the trouble to contact the manufacturer and was assured that there were no chemicals. This sponge works because of the nature of its structure. I have used it and introduced it to my students at Artists on the Bluff. They have been amazed at its versatility. You can use it to clean up washes and you can use it to paint. Do bear in mind I am aware that this is not breaking news but for those of you who have not yet encountered its (Magic Eraser’s) use I thought I would share. © [Don Rankin] and [donrankinwatercolorstudio], [2012-2013]. Unauthorized use and/or duplication of this material without express and written permission from this blog’s author and/or owner is strictly prohibited. Excerpts and links may be used, provided that full and clear credit is given to [Don Rankin ] and [donrankinwatercolorstudio] with appropriate and specific direction to the original content. Lynn McMorrowMy deepest condolences on the loss of your wife. Catherine BurnettThis painting is impossibly beautiful. Thank you for sharing and inspiring.